The Hall of Presidents is an iconic Magic Kingdom Park attraction offering an inspiring journey through American history, anchored by Audio-Animatronics likenesses of all U.S. presidents. Captioning Assistive Listening System, Audio Description and Reflective Captioning. A full show video of the newly updated Hall of Presidents from Walt Disney World. The Hall of Presidents is now open following its update. See video of the new audio-animatronic Donald Trump figure at the Magic Kingdom. Although closed for the majority of the year, the Hall of Presidents will return in the next few weeks. This show is a true icon of the Magic Kingdom. The waiting area alone has a remarkable collection of real artifacts owned by US Presidents. The waiting room also usually has knowledgeable cast members. Look for James, he has an endless knowledge of presidential trivia. The current show, narrated by Morgan Freeman is very emotional. Highlighting the most influential and important presidents of years past, the video/photo montage is beautifully done. Last but not least, the animatronics are remarkable. The ones with primary speaking roles include Abraham Lincoln, George Washington and Barack Obama. Unfortunately for many families, kids may not have the patience to enjoy this 25 minutes show. For those who have the opportunity, don't miss this treasure of an attraction. My wife and I went in think it would be interesting and fun. Boy were we wrong. I thought I was in a college lecture with a really boring professor. I find a LOT of what is being conveyed here as propagandized half-truths and activist satiating drivel- It's somewhat offensive. It's a FAR cry from the original intent. The Hall of Presidents is one of the original Magic Kingdom attractions. It debuted on Oct. 1, 1971. Located in Liberty Square, The Hall of Presidents is a multi-media presentation based on United States history. 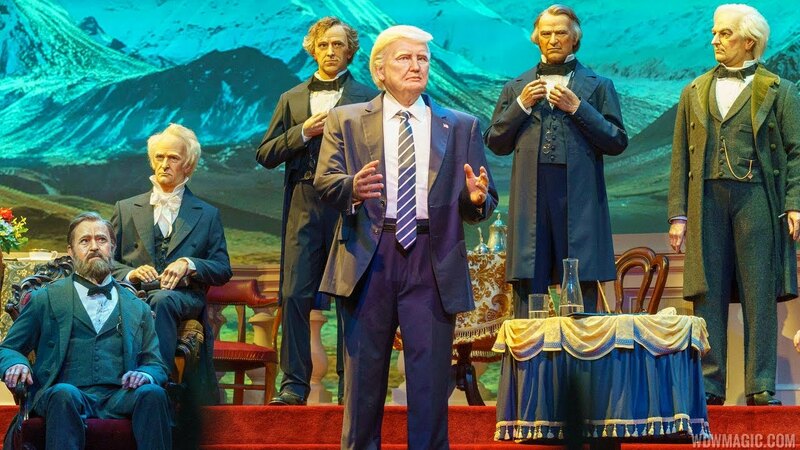 At the center of the story are the presidents, all of whom are showcased in the form of lifelike Audio-Animatronics figures. The attraction closed November 1 2008 to begin it's most significant refurbishment ever ready to reopen on July 4 2009. The animated Lincoln figure debuted at the 1964 New York World’s Fair. It became part of the Great Moments with Mr. Lincolnattraction which debuted in 1965 at Disneyland in California. When Walt Disney World Resort opened in 1971, the Hall of Presidents attraction brought to life Walt’s original idea of a showcase for all the presidents. In the 2009 re-launch of the attraction, Lincoln recites the Gettysburg address with the original Royal Dano recording directed by Walt for President Lincoln’s World’s Fair debut. DIGGING FOR DETAILS: The Imagineering team combed through the National Archives, Library of Congress, museums and private collections to acquire more than 130 new images ultimately woven into the show. 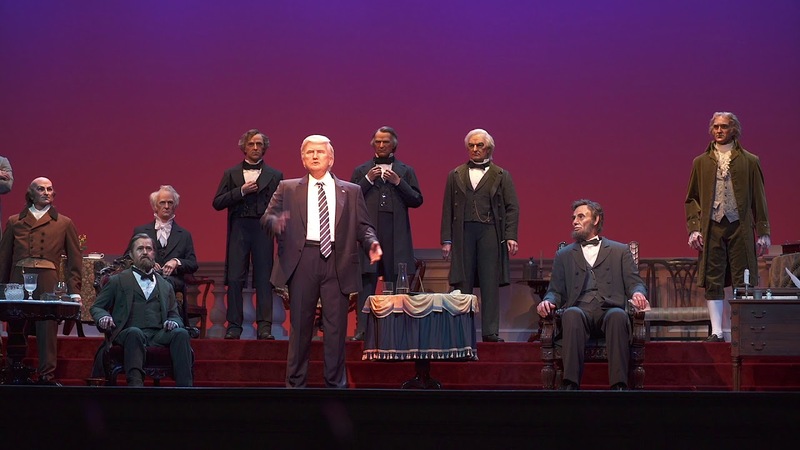 Every president – life-sized, three dimensional and fully animated – who has served the nation appears on stage in the form of an animated figure. Since opening in 1971 during Richard Nixon’s term, the show has added seven presidents, including Barack Obama. ALL SPIFFED UP: Some of the animated presidents were sent to wardrobe for a change of costume. Because of the repetitive movements of the figures, the clothing gets stressed from the inside – especially around elbows and knees – and wears out over time. Some of the presidents also received new wigs and beards. LET’S GET THE NUMBERS STRAIGHT: If Barack Obama is the 44th president, why are there only 43 men standing on the Hall of Presidents stage when the curtain rises? Obama is the 44th president, but Grover Cleveland served two non-consecutive terms, so he is both the 22nd and 24th president. His figure is one of the most lifelike because of the subtlety and smoothness of its movements and facial expressions. Disney legend Blaine Gibson sculpted every president except Obama – his protégée, Disney sculptor Valerie Edwards, sculpted Obama with oversight by Gibson, now 91. Abraham Lincoln recites the complete Gettysburg Address rather than his previous, shorter speech. George Washington speaks for the first time in the show, explaining the importance of the presidential oath of office using portions of a speech he actually gave during his second inauguration ceremony. The first contemporary president to speak in the show was Bill Clinton, and George W. Bush followed eight years later. AUDIO CHECK: When Imagineers met with President Obama, they were scheduled to record his speech in the White House Map Room. The sound quality wasn’t optimum for the recording, so White House staff placed upholstered screens around the room to achieve good acoustic quality. Emmy-winning composer Joel McNeely wrote the soaring musical score. Academy Award-winning actor Morgan Freeman narrates the “re-Imagineered” story. David Morse is the voice of George Washington (he also played Washington in the 2008 Emmy and Golden Globe award-winning HBO mini-series, “John Adams”). Late character actor Royal Dano is the voice of Abraham Lincoln. Pulitzer Prize-winning author and historian Doris Kearns Goodwin provided historical insights for the storyline. Imagineers digitized many of the huge paintings of scenic America created for the original movie by Disney legends such as Herb Ryman (who designed Sleeping Beauty Castle for Disneyland) and Sam McKim (film and attraction artist). Previously presented in 70mm film, the movie now is projected in high-definition video. An all-new audio system offers crisp, digital sound. LIGHT BRIGADE: Lighting experts were able to illuminate the show with energy-efficient LED lighting that enhances the color and texture of the show. SIT BACK AND ENJOY: The theater seats 700 guests, with expanded seating areas for guests using wheelchairs. CLOSER TO HISTORY: The pre-show lobby features presidential portraits, display cases filled with personal artifacts of presidents including Gerald Ford, Franklin Roosevelt, Herbert Hoover and George Washington, and large display cases exhibiting dresses and personal objects worn by several first ladies, including Edith Roosevelt (Teddy’s wife), Elizabeth Monroe and Nancy Reagan. 18th CENTURY CHARM: The Hall of Presidents building recalls the Federal-style civic buildings of Philadelphia.